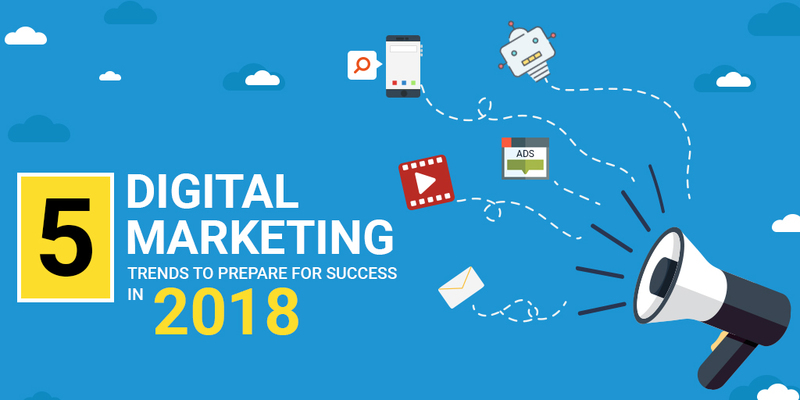 With 2018 being just around the corner, I am sure most of the marketing strategist must be busy working out their digital marketing campaign for the new year. Devising a right strategy to connect with future customers in the era of numerous emerging technologies and platforms is indeed a challenging task. Knowing beforehand the trends that will work in the coming years and prepare for it in advance increases the chances of success manifold. Here are some sure digital trends that will rule 2018. Micro-moments: Micro moments are those when consumers use their devices to learn, compare or buy a product or service within the shortest span of time. They tend to make the decision in this time span only and therefore businesses which are correctly able to address this impulsive quest for information will lead in 2018.Today 96% of users pick their smartphone to type their quarry and find the result. For this, businesses first need to concentrate on mobile-friendly websites and then need to study the micro-moments of your target audience in order to offer the consumers the instant information they are looking for. Video advertising: With the increasing ratio of younger demographic, the demand for video content which can be watched on various devices has raised. 43% people said that they hold to see a video add whereas surpass a written content. Many brands have started uploading short videos with interesting content on various social media platforms so that they can be liked, shared and discussed by the younger generation. 52% marketers strongly believe that visual content has more engaging power and better ROI than other ways of advertising. Chatbots: Chatbots are the new essential ingredient for a successful digital marketing campaign. Being artificial intelligence supported, they are highly prompt to assist the fast-paced and hyper-connected generation of today. The posh clothing brand H&M has recently launched its chatbot called ‘kik’ which engages the audience and act as a personal stylist to them. It learns about the consumer’s style by scanning their social photos and then suggest outfits accordingly. As per Business Insider, 80% of businesses will integrate chat bot into their strategy by 2020 for an effective hold on consumers. Personalisation: Over the past few years businesses have utilised the email marketing strategies to give the touch of personalization to their consumers but now consumers want this across all touch points of their journey. They want to be felt as a person and not a number when they visit the website.It is important to understand your customers, their social and digital habits, response or liking towards the type of content and then design, create or write accordingly so that they feel special and happy. Native ads: Native ads are the right marketing method to grab the attention of the right audience. It is a common complaint of users that irrelevant ads pop up from nowhere when they are browsing for something else. Native ads solve this issue and in a quite non-disruptive way blend easily with the environment the user is in. May it be recommended content, advertorial, search advertising, instant content or sponsored listing form of native advertising, it has always worked by coming across the right user at the right time. Thus, seeing 2017, it is clear that the scope of engaging and interacting digitally with customers is boundless and businesses now should not wait to incorporate these trends for better results in 2018.